I, and others, asked what the lux level of the scene was. (background: Lux Rating / Minimum Illumination Guide, and Training: Using a Lux Meter). 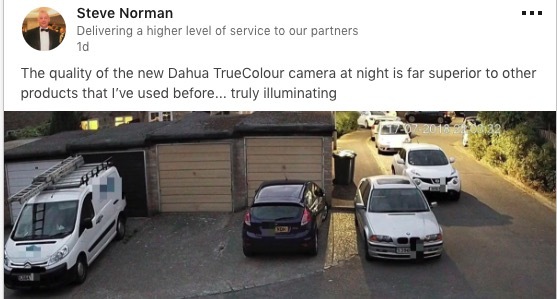 Dahua UK's response: "didn’t check the lux levels but it was dark," later noting "it was 2300 with a couple of streetlights in the distance." It is embarrassing that Dahua, a company that claims 6,000 engineers and to be #2 globally, cannot understand the importance of knowing the lux level. 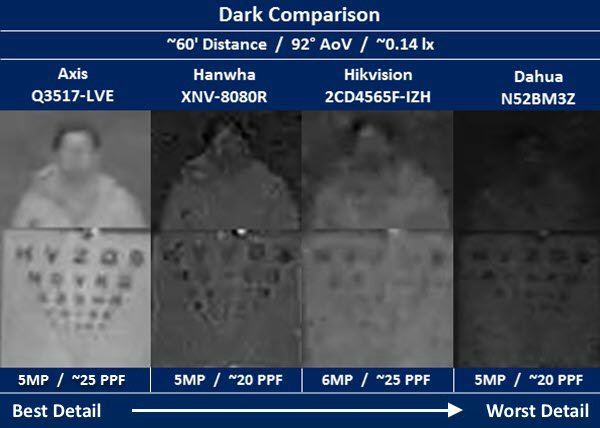 Here's why it is important: The word 'dark' is commonly applied to scenes varying from 5 lux down to .001 lux or lower. 'Dark' is subjective. A scene that is 1 lux and a scene that is 0.1 lux are both 'dark' but it is far harder to produce quality images the lower the lux level is. Moreover, comparing a camera in a 'dark' 1 lux scene to another camera, at another time, in another place, in a 'dark' 0.1 lux scene will result in an erroneous judgment. Salespeople like taking a one-off picture of their cameras 'in the dark' to brag about how good it is, but without any context of the light level or comparison to others, even a bad camera can be promoted as being superior. In fairness to Dahua, this is not their worst marketing of the summer. Their embarrassing IFSEC AI demonstration is still clearly tops.